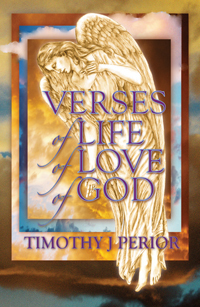 Timothy J. Perior’s “VERSES of LIFE, of LOVE, of GOD.” This book of inspirational poetry reflects my search for the meaning of life: I demanded to find it face to face, breath to breath. And then I found it in salvation and years of joy. God is the theme of my book as if He was observing us and I was privileged to listen in to His thoughts. The world in turmoil so if a word or a poem can reach someone and turn them toward righteousness, toward life and not death, then it is a “word” of life.